A paper published March 11 in the journal Applied and Environmental Microbiology describes microbial communities found in shower hoses at a major U.S. hospital. The study documented bacteria – and related genes – using cutting-edge metagenomic techniques that allow the characterization of organisms that cannot be detected using traditional culture-based microbiology assays. Researchers from the U.S. Environmental Protection Agency and the Georgia Institute of Technology collaborated to study these biofilm communities, but can’t say yet if these bacteria pose a threat to hospital patients. But because some of the genes could indicate pathogenic characteristics – such as resistance to antibiotics – the researchers want to learn more about the potential health implications, and whether other buildings house similar biofilms. Antibiotic resistance is a public health emerging priority identified by the World Health Organization, which in 2015 released a global action plan to address the problem. The study began by culturing bacteria from 40 shower hoses removed from individual hospital rooms by EPA researchers. Nucleic acid was extracted from five of the shower hoses and processed using next-generation sequencing technology. The sequencing data was sent to Georgia Tech, where doctoral student Maria Juliana Soto-Girón matched the sequences against known bacteria – and genes that have known effects, such as virulence and antibiotic resistance. The microbiome study found an abundant population of bacteria that the researchers believe are novel “Mycobacterium-like” species not described previously, closely related to Mycobacterium rhodesiae and Mycobacterium tusciae. 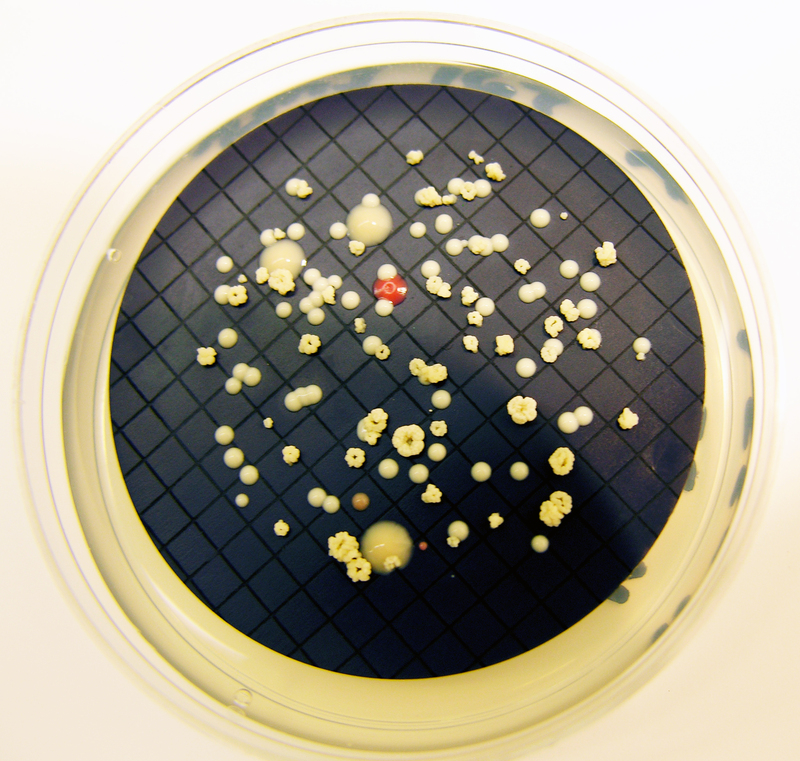 Traditional culture-based methods instead identified organisms affiliated with Proteobacteria – such as members of the genera Sphingomonas, Blastomonas and Porphyrobacter – as the most abundant. The biofilm communities harbored genes related to disinfectant tolerance, which constituted 2.3 percent of the total annotated proteins – and a lower abundance of virulence determinants related to colonization and evasion of the host immune system. Additionally, genes potentially conferring resistance to beta-lactam, aminoglycoside, amphenicol and quinolone antibiotics were identified. The frequency of these genes was higher than the frequency found in Lake Lanier, a natural freshwater ecosystem that has been studied by the Georgia Tech research team, suggesting that the drinking water pipe environments merit closer attention. The research grew out of an EPA research project to understand the issues of drinking water systems and building microbiomes – the collection of microbes found in such structures. While biofilms are common in building water pipes, this study generated the most metagenomic data so far for the organisms living in these water systems. Additionally, the researchers analyzed 94 partial genomes of isolated biofilm bacteria, including some that had not been reported before, though they are related to previously-characterized microorganisms. Though well-known pathogens weren’t seen in abundance, the presence of genes for antibiotic resistance, resistance to water disinfectants and virulence raises concerns because bacteria can share such genes to potentially become more significant health threats. The analysis of material taken from the shower hoses is only a preliminary study, and much more research will be needed. Santo Domingo compared the findings to a “check engine” light in an automobile. The warning doesn’t necessarily indicate an immediate problem, though it does show that attention – and potential action – may be required. The potential clinical significance of the bacteria needs to studied, and any public health impacts understood, he added. Other questions include whether similar biofilms would be found in other hospitals, whether biofilms differ among facilities, how monitoring should be done – and whether shower heads and hoses should be replaced on a regular basis. In addition to those already mentioned, the paper’s authors included Luis Rodriguez and Chengwei Luo from Georgia Tech, Michael Elk and Hodon Ryu from Pegasus, Inc., and Jill Hoelle from the EPA. CITATION: Maria J. Soto-Girón, et al., “Characterization of biofilms developing on hospital shower hoses and implications for nosocomial infections,” (Applied and Environmental Microbiology, 2016). 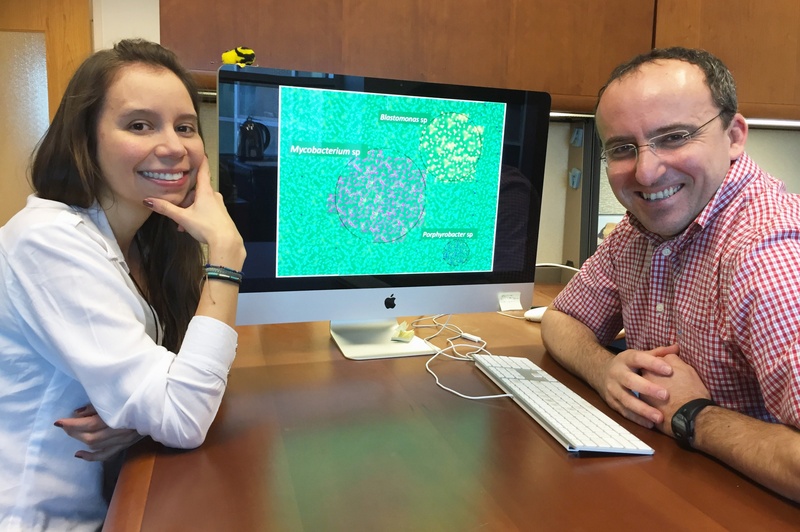 Georgia Tech Doctoral Student Maria Juliana Soto-Girón and School of Civil and Environmental Engineering Professor Kostas Konstantinidis are shown with images of bacteria. Research done with scientists from the U.S. Environmental Protection Agency documented bacteria in shower hoses taken from hospital patient rooms. (Credit: John Toon, Georgia Tech).